Create basic websites from Markdown files with this useful open source tool. What an Mdwiki site looks like. What the webserver folder for that site looks like. I renamed the MDwiki HTML file START.HTML for this project. There is also one Markdown file that deals with navigation and a JSON file to hold a few configuration settings. Everything else is site content. While the overall website design is pretty much fixed by MDwiki, the content, styling, and number of pages are not. You can view a selection of different sites generated by MDwiki at the MDwiki site. It is fair to say that MDwiki sites lack the visual appeal that a web designer could achieve—but they are functional, and users should balance their simple appearance against the speed and ease of creating and editing them. Markdown comes in various flavors that extend a stable core functionality for different specific purposes. MDwiki uses GitHub flavor Markdown, which adds features such as formatted code blocks and syntax highlighting for popular programming languages, making it well-suited for producing program documentation and tutorials. MDwiki also supports what it calls "gimmicks," which add extra functionality such as embedding YouTube video content and displaying mathematical formulas. These are worth exploring if you need them for specific projects. 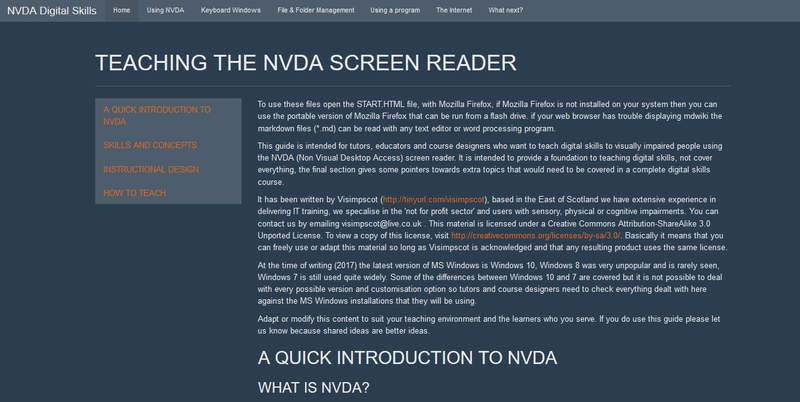 I find MDwiki an ideal tool for creating technical documentation and educational resources. I have also discovered some tricks and hacks that might not be immediately apparent. MDwiki's default color scheme is not ideal for all projects, but you can replace it with another theme downloaded from Bootswatch.com. To do this, simply open the MDwiki HTML file in an editor, take out the extlib/css/bootstrap-3.0.0.min.css code, and insert the downloaded Bootswatch theme. There is also an MDwiki gimmick that lets users choose a Bootswatch theme to replace the default after MDwiki loads in their browser. I often work with users who have visual impairments, and they tend to prefer high-contrast themes, with white text on a dark background. 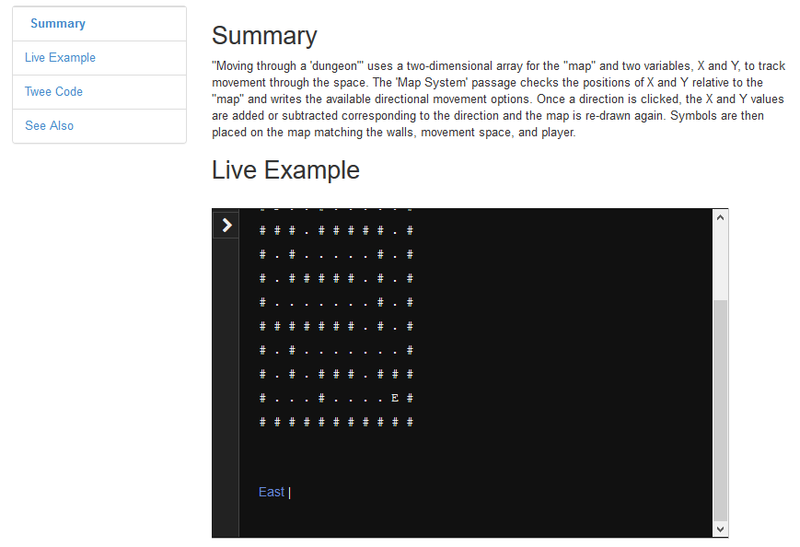 This HTML will display an HTML page created by the Twine interactive fiction engine inside a Markdown file. In short, MDwiki is an excellent small application that achieves its purpose extremely well. 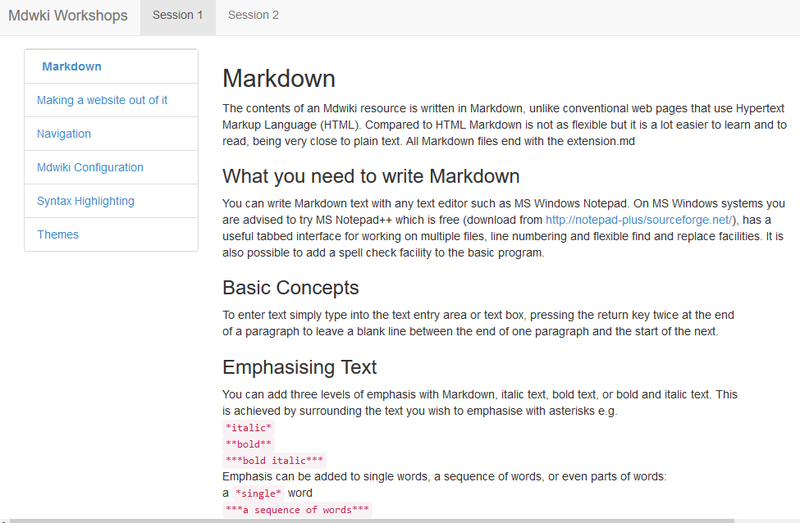 For extensive markdown notes for personal use, developed over years, MDwiki is the best choice for me. Combined with a Dropbox static web server like Updog, I keep my collection of notes isolated in their own Dropbox directory for use with other apps, if need arises. MDwiki can be easily modified. E.g., I've designated a separate directory for markdown files, my own collection of smartypants, standard outline numbering for the TOC, and the option of using Showdown instead of the included Marked. Downsides include a noticeable 1-2 second delay waiting for page creation, no ability to search notes, and no updates in years (it appears to be a dead project). But given the large number of markdown and wiki projects now available, it is a testament to the creator of MDwiki that no other project meets my needs.